Facing directly into the Atlantic Ocean, this stretch of coast picks up plenty of swell. The coastline from Land's End to Newquay has some of the UK's best surfing beaches including the most well known, Fistral Beach. Fistral is and always has been the home of British surfing, it's where surfing really began in the UK and it hasn't looked back since. Whether this is good or not is debatable, as it is probably the most crowded beach in Britain (although Croyde competes for this title) becoming somewhat of a zoo in the summer months. It's difficult to visit Fistral without being reminded you are at the HQ of Newquay - 'Surf City UK'. The National Surfing Centre at the northern end of the beach and the anual Rip Curl pro surfing competition you should be left with little doubt. It's easy to assume that with all the hype and it's status, Fistral would also be the UK's most overrated beachbreak. Well, actually no - it is in fact still one of the best beachbreaks in Cornwall. Suprisingly consistent, on it's day Fistral is capable of producing powerful, hollow waves and holding a good sized swell. It even has the bonus of being sheltered enough and sufficiently north-facing in places that it can get away with a south westerly wind. The beach is divided up into South Fistral at the Pentire end, Fistral and Little Fistral at the Towan end. Whilst South Fistral provides a good escape from the bulk of the crowd, Little Fistral provides the best waves. On a good day you can score long, walling, barreling waves here, but there are quite a few rocks so maybe not ideal for the beginner. 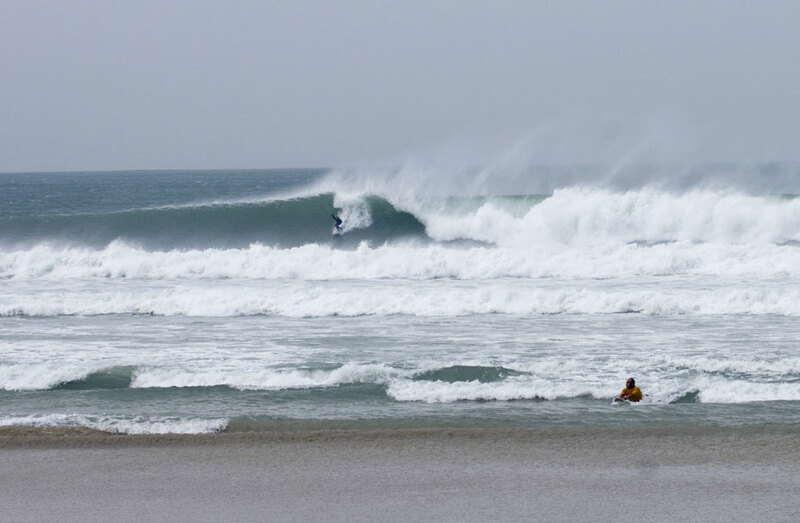 Fistral is also home to the legendary big wave spot, The Cribbar. Breaking at up to 20ft, the Cribbar has only been surfed a handful of times as it requires a pretty monsterous swell to break. First surfed in1967 the wave has gained increasing media interest over the years and most recently was featured on national TV with tow in surfers riding 4X overhead waves. Right in the heart of Newquay, Lusty Glaze is a safe and sheltered privately-owned beach nestling at the bottom of 200 foot high cliffs. At low-tide the beach joins up with the neighbouring Tolcarne Beach, otherwise the only way down is via some very steep steps. The semi-consistent beach break is absolutely packed in summer, but does offer the occasional barrel on a wintry south-westerly storm. Mawgan Porth is a large and popular curving sandy beach with plenty of facilities and lifeguards in season. It has a relatively low profile among the surfing community, and remains a lot less crowded than the beaches in and around Newquay, just a few miles down the coast. Easterly winds provide clean waves at this fairly consistent break which works best at low to mid-tide and fills up at high. There are plenty of rights in the middle of the beach and lefts in the left-hand corner. Beware if you check it from the car park as it is always bigger than it looks and offers merciless close-outs and powerful rips in big or stormy conditions. Crantock is a good choice for learners and is often less crowded than the bigger (and better) spots nearby. 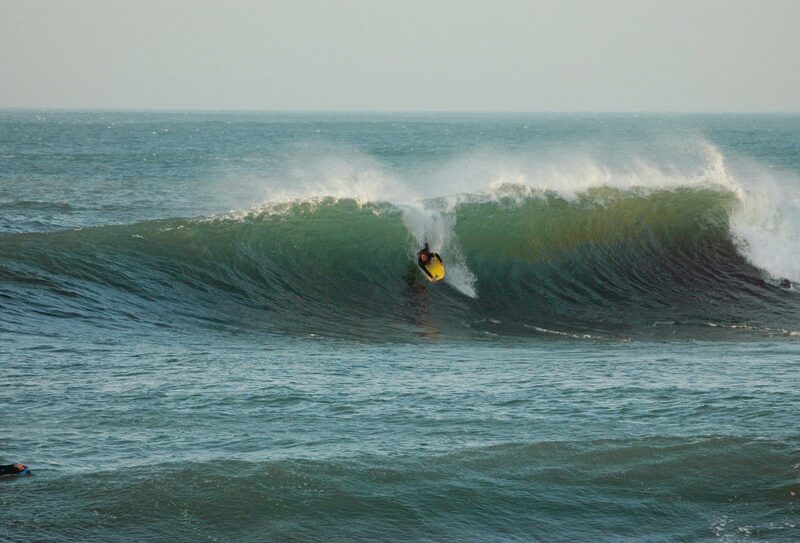 There can be some good peaks down on the sheltered westerly side, while experienced surfers usually use the river on the east side for a quick paddle out to some more challenging outer banks. Crantock offers some protection from south-westerlies but can get very big in winter. There are car parks at Crantock Beach and West Pentire and the beach is backed by sand dunes. Much of the nearby land is owned by the National Trust. Inhabitants of Crantock village hold the Guinness world record for bale pushing. 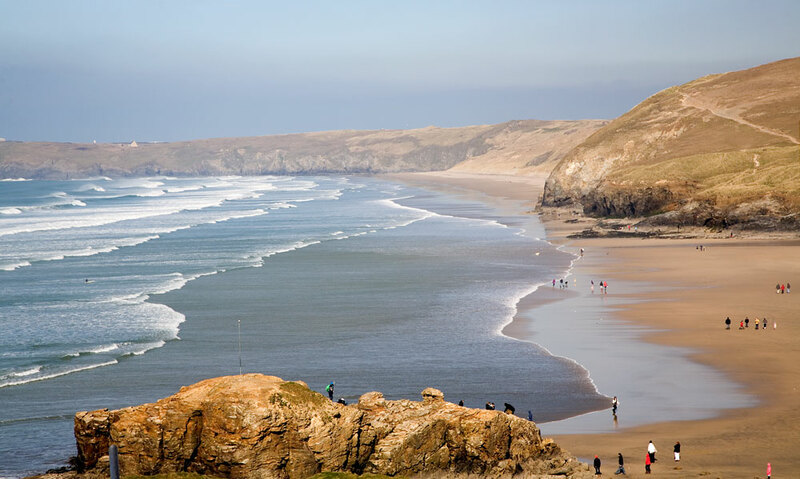 A huge, sweeping sandy beach, Holywell Bay is backed by extensive, and protected, sand dunes. The bay takes its name from an ancient cave at the north end of the beach which has a spring emerging from the ground that is thought to be a holy well. Not too crowded, safe and clean, the surf is usually good for beginners and longboarders, working best at high tide on a medium swell. When it's big enough there can be good rides breaking off a rock stack at the southern end. Watch out for strong currents. In summer the lifeguards separate body boarders from stand-ups, usually giving the stand-ups the best section. Park in a National Trust car park overlooking the sand. Beach shop, takeaway, pub and surf schools. 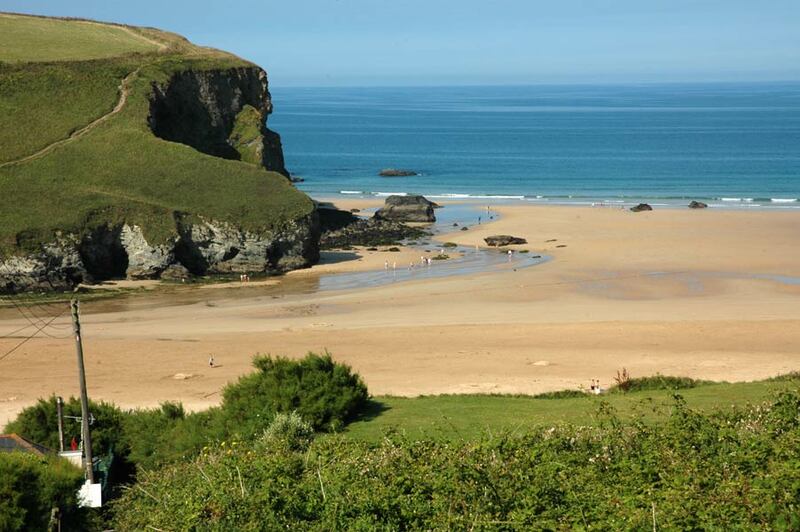 Perranporth is easily one of the longest beaches in Cornwall, composed of over three miles of golden sand. Quieter than the Newquay beaches it does nevertheless get crowded during the holiday months, especially as the waves are friendly and good for beginners and the beach is part of a bustling town. There is plenty of space to spread out, however, and more experienced surfers generally head to Droskyn Point, on the far left side, where sandbanks often yield sizeable well-formed waves and there is some protection from south-westerlies. The paddle out can be tough, however, and so can the locals. 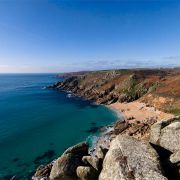 St Agnes is renowned for being central to four stunning beaches, with the two best, Chapel Porth and Porthtowan located to the west of this thriving, former mining town. 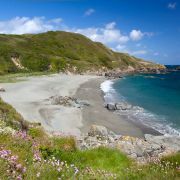 The nearest beach to the town centre is Trevaunance Cove, commonly known as Aggie Beach, while Trevellas Porth offers great snorkelling and fishing. 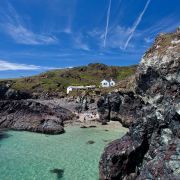 The rock pools and caves at Trevaunance Cove make this a popular beach for families. There is some reasonable surf here at times, but it is always a lot calmer than Chapel Porth or Porthtowan, with the right angle bend in the coast between Trevaunance and Chapel Porth providing ideal conditions. If Trevaunance is flat, go around the bend to the more exposed breaks and if they're too big, come back to Trvauanance. Perfect for beginners. 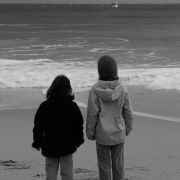 There are plenty of facilities in the town and at the beach, including plentiful parking. Beach huts are available for hire. Chapel Porth, approximately two miles from St Agnes, can be epic. 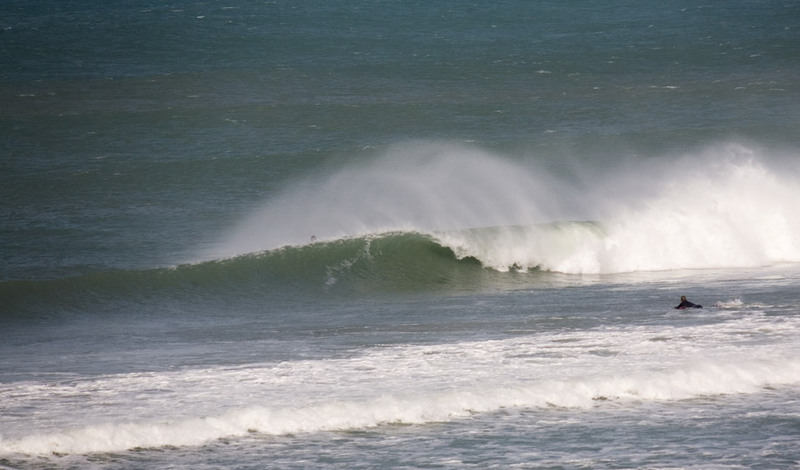 When conditions are right it produces some of the best waves in the UK. 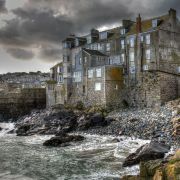 Unfortunately it also seems to produce some of the worst localism, even on a bad day, with many still harbouring a grudge that their secret spot ceased to be so secret after it featured on a channel four documentary about ten years ago. If you can handle that, the cove, relatively small at high tide and extending all the way to Perranporth at low, can produce a good, fast beach break with a nice right hand point on a rising tide. There is ample parking right at the beach in a National Trust car park, and a good beach café overlooks the cove. The right side of the beach is usually the best but beware of rips. The waves are usually fine for beginners, unless it's big, in which case trundle around the headland to Trevaunance Cove. Good quality beach break, capable of providing punchy waves at most states of tide. The beach faces pretty much due west so is offshore in an easterly wind, although high cliffs provide some degree of shelter towards hightide. When it's good here it's very good with decent barrels to be had and the ability to handle a decent sized swell. This is reflected in the standard of surfing and the beach's popularity. At low tide the beach is much bigger and joins up with Lushingtons to the south which is reknown for it's barrelling left handers. Probably not one of the best beaches for beginners, particularly towards high tide when it becomes a little narrow and rocky. Plus the local crew aren't the most tolerant! Portreath is a small, sandy beach with a high headland at the left end that offers rare protection from the prevailing south-westerlies. A beach break in the middle of the bay can be good for beginners, although it often becomes crowded in summer and the small beach means the rides are never very long. Meanwhile the harbour wall offers a right-hander which works best at mid to high tide and turns into a fast and hollow reef break, with some left-hand barrels too. Bodyboarders love Porthtreath for its big, barrelling shorebreak. This is a heavy, often dangerous break and definitely best left to the more experienced surfers. There are plenty of facilities in the village. Hayle has a four-mile long wide, sandy beach that stretches from the river estuary all the way to Godrevy and is backed the whole way along by dunes, in Cornish 'Towans'. The sand is clean and golden and as you travel northwards from the estuary towards Godrevy there are progressively fewer signs of human habitation until finally all you are left with is an offshore lighthouse and a National Trust earth car park. The surf becomes bigger and more consistent as you travel north. While it is usually flat near the rivermouth, there is almost always some kind of a wave at Godrevy. Conversely, while it usually clean at the rivermouth the waves tend to become progressively messier as the beach becomes more and more exposed to north and westerly winds. 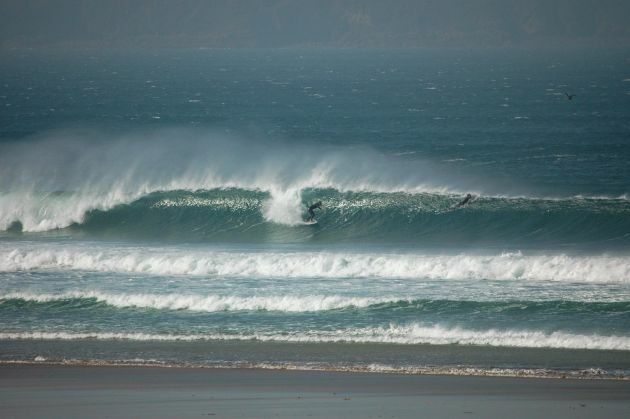 The rivermouth, accessible from Hayle Towans, can be good on a big swell, although the currents tend to be very strong. There is occasional decent surf at Mexico Towans, and more frequent waves at Upton Towans, known locally as 'The Site'. The consistent surf really starts at Gwithian, however, for which there are a couple of access points, including a large car park, manned in summer, from which you can check the waves without leaving your car. Gwithian tends to produce slow, long rides, even on big days, although at low to mid tide it can be hollow. The waves to the southern side tend to be smaller, there are some rocks and usually plenty of longboarders. 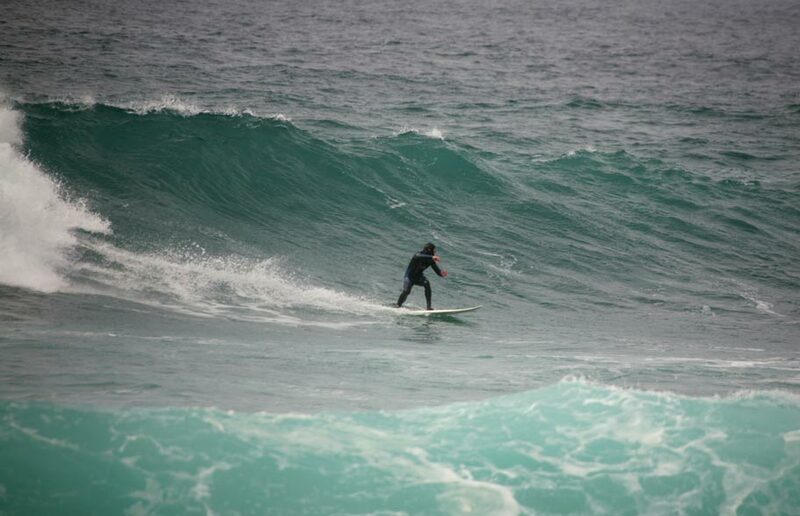 Gwithian can usually be surfed throughout the tide although beware of getting cut off by the cliffs on a high spring. Godrevy is subject to strong currents and can produce big waves when there's plenty of swell. The waves here tend to be punchier than those at Gwithian and they tend to get bigger and more powerful as you approach the lighthouse. Avoid at all costs the channel between the beach and the lighthouse as it is subject to ferocious currents. There is a National Trust car park at Godrevy and a beach bar, The Sandsifter, which hosts the best dances in Penwith and is home to the Gwithian Surf Academy. Overlooked by the Tate Gallery, Porthmeor is the only beach on the peninsula that offers real protection from the prevailing south-westerly winds. Usually small and clean it is a good choice if the rest of the north coast is blown out with punchy and fairly powerful waves at high tide and a variety of peaks. On its day Porthmeor can produce very big waves and it can hold a big swell. 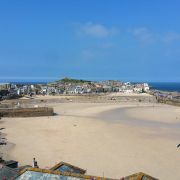 There is a small car park overlooking the beach and all facilities in St Ives. Separated from Sennen by a small headland and often joined at low tide, Gwenver is Sennen's wilder, more remote and unruly sister. It really is true that if there's no surf at Gwenver there's no surf anywhere and it is often the case that somehow there's a wave here at mid to low tide even when the entire coastline is as flat as a pancake. The flipside to that is that it can get very big and very stormy with powerful rips and exhausting paddle outs, at which point it is usually better to head next door to Sennen. There are a variety of peaks, the best of which is probably the point on the right which can produce powerful rights and lefts, depending on the sand banks and the swell direction, although it only works from low to mid tide. There are usually decent rights and lefts in the middle of the beach and on the left side and often a nice, uncrowded peak off Little Gwenver, which sits between Gwenver and Sennen and also only works from low to mid tide. The beach works almost through the tide although it does tend to fill up at high. Parking is limited in winter, although there is a manned car park on top of the cliff in summer. Access is via a great flight of steps. It can get very crowded during weekends or holidays and localism is becoming a real problem here. There are no facilities. Whitesands beach at Sennen is a long, crescent shaped, sandy beach. It's shape makes it resonably consistent with regards to the wind direction - any wind from ENE round to SW is vaguely offshore. Having said that it does mean you'll be surfing different ends of the beach so the size of the swell is a factor. Although Sennen doesn't really hold big surf, a big swell isn't really a problem as the southern end of the beach is well sheltered. 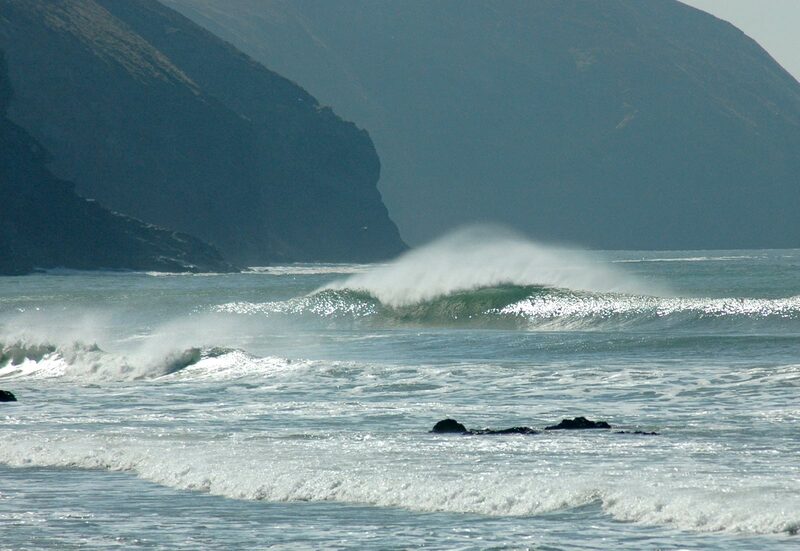 Due to it's position in the far west of Cornwall it does tend to pick up any swell that' going. There are a variety of banks which work at different states of the tide, although the best wave is probably to be found on smaller swells, just off high tide towards the northern end of the beach. Sennen is often a rather 'fat', slopey wave making it ideal for beginners, however there can be strong rips here and when it's bigger it does have some power.